At St Jude & St Paul's we were lucky enough to have the Barbers come to visit us and see what we have been doing. As part of Raspberry Pi club we presented our project along with a demonstration for the Barbers in our morning assembly. We were lucky to get a visit from two survivors of World War Two who came to mark Remembrance Day with us, and then came back to our classroom to be interviewed by the Year 6 research team! Our visit to the RAF museum was a fun packed trip full of historical interest and spectacular planes! Here are some pictures of our trip. Year 1 went on a trip to Clissold Park and had a fantastic time! On 26th September Year 3 and Year 4 visited the Finsbury Leisure Centre. They had a chance to try a number of different sports, including Goalball, Tag Rugby and Judo. They all had a great time trying new games they haven't played before. Publicis and Sports Inspired, who ran the event, also gave us a report which you can read here. Year 6 visited the Jewish Museum. They learned a great deal on the trip and were all deeply touched by the experience. 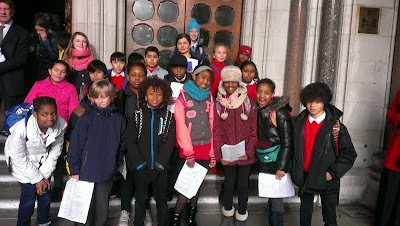 Year 4 went on a trip to the foreshore of the River Thames as part of their topic on Water. They were archaeologists for the day! They went to the Museum of London and learnt how to date the artifacts they had found.